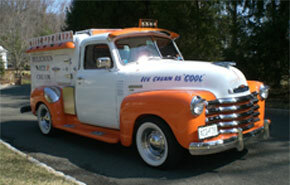 Our classic ice cream truck will make any event memorable. All our trucks are equipped with a external high fidelity sound system playing your favorite songs from the 50's and 60's. We Re-create the past when our museum quality trucks arrive at your event. It's not about the ice cream...it's all about the experience! Make Your Special Day Really Special! We have been a big hit at Weddings, Bar Mitzvas, Bat Mitvas, Anniversaries and Adult Birthday Milestones! Our trucks have been used for various photo shoots and movies. We were filmed in the 2015 release of Steven Spielberg's "A Bridge of Spies" starring Tom Hanks. Our trucks have been rented by professional photographers for Photo Sessions. Call today to book our truck for your next event. Delicious Ice Cream makes the August edition of New Jersey Monthly! See us in the Upcoming October 2015 Steven Spielberg movie "A Bridge of Spies"
The Delicious Ice Cream Company is recreating this past experience providing a unique and nostalgic opportunity to individuals, companies and event planners seeking something very cool and different for their next party or event. 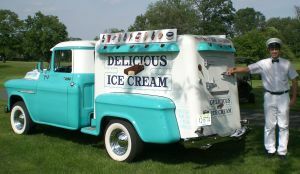 One of our fully restored 1950's custom truck will arrive at your party or event with an authentic ice cream man dressed in that same old fashioned outfit you remember as a kid. Call us today to book your trip down memory lane at 908-766-0468.